Germaniae Nova ac accurata descriptio... - DANKERTS / CLOPPENBURGH, E.
Map maker : DANKERTS / CLOPPENBURGH, E.. Size : 19.5 x 24.1 inches. / 49.5 x 61.1 cm. Description :This beautiful and rare "carte à figures"- map is a close copy of the 1621 map by Visscher. The map is surrounded on all sides by figures, town views and coats of arms. The title in capitals and the Imperial coat of arms in the centre of the top border is surrounded by the emperor and the seven Electors on horseback in a half-circular arch. 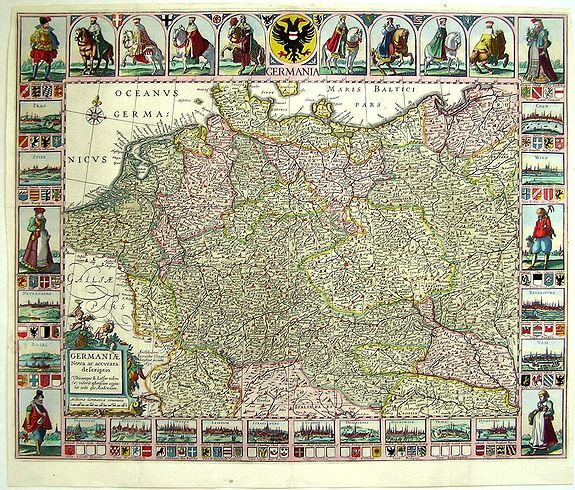 Along the bottom border runs a series of ten town views with four coats of arms underneath: Frankfurt, Augsburg, Metz, Leipzig, Strasbourg, Lubeck, Heidelberg, Braunschweig, Trier and Hamburg. Left border: three costumed figures and the town views Prague, Spiers, Nürnberg and Basel. Right border: three costumed figures and the town views of Cologne, Vienna, Regensburg and Ulm. In 1630 Jodocus Hondius' imprint was replaced by that of Everard Cloppenburg. Condition : Excellent condition. Backed with Japanese paper. Borders approx. 2.5cm all around.